Beatlemania swept across North America when John Lennon, Paul McCartney, George Harrison and Ringo Starr appeared on The Ed Sullivan Show in February 1964. The decade of the 1960's seemed to change overnight from black and white to color as a generation fell under the influence of the group's music, style and personalities. Hot on the success of A Hard Day's Night, the Beatles 1964 summer tour filled auditoriums with screams of delight and excitement - and in some cases, full-blown fan hysteria. This was the case on September 15th in Cleveland, Ohio when police stopped the show in mid-performance and ordered the Beatles off the stage. The next year, The Beatles and all rock'n roll shows were banned from appearing in the city now home to The Rock and Roll Hall of Fame. In August 1966, the group launched their final tour, but the innocence portrayed in A Hard Day's Night only two years earlier was missing. Controversy raging over Lennon's remarks about Christianity and the group being more popular than Jesus made their safety more of a concern than ever before. A scheduling change brought the Beatles back to Cleveland on August 14th for the tour's first outdoor show at Municipal Stadium. The results were the same, but on a much larger scale. The uncontrollable hysteria of Beatlemania reached a fever pitch as thousands of fans poured from their seats and crashed over police lines to be near their British Idols. It was obvious they could no longer be protected in front of audiences and the first murmurings were overheard that it would be the last tour. The Beatles In Cleveland brings to life both these special moments in time: two of the wildest, out of control concerts in Beatles - and rock - history. Go behind the scenes to bring John, Paul, George and Ringo to the city, then grab a front row seat for back stage and on stage excitement through eyewitness accounts from the promoters, concert MC's, deejays, journalists, opening acts and fans. The story is also told through rare, never-before published photos, video stills and memorabilia. A concert by The Beatles was not just about the music, but also the emotions stirred by the most influential group in the history of popular music. Foreword by Bill Harry, Founder and Editor of the legendary 'Mersey Beat' newspaper. Now in The Rock and Roll Hall of Fame & Museum Library and Archives! "If you'd like to experience what it was like to participate in a Beatles concert, we can't recommend 'The Beatles In Cleveland' strongly enough." "Dave Schwensen did the impossible. Through his writing he took my mind from the California coastline to Cleveland and made me enjoy it. I was mainly skeptical that he could write a whole book about a single happening - the two Beatle concerts in said city and hold my interest. Not only did he accomplish both impossibilities, he totally drew me into the whole experience and gave me new insight into something I thought I knew something about. Good show, mate!" "As John Lennon once said, 'You had to be there.' Well, Dave Schwensen has created the nearest thing to actually witnessing the Cleveland concerts and it's a worthwhile contribution to the growing canon of works about the greatest rock group of them all." "I was swept back to that night and relived the elation, awe, panic, tension and immediate instinctive reaction that made up the moment for me." "This book is a must read for the fan who's never been witness to The Beatles concert mania first-hand, and even more important to anyone who's actually seen The Beatles live. As a broadcaster, I was impressed with Dave's research into the competitive world of 60's Top 40 Radio. What a fun book!" "A compelling and satisfying read, not only for a generation that remembers the edgy, youthful excitement that followed the band's every move back then, but for the countless young musicians looking to be inspired anew by music's greatest phenomenon." (Almost) half a century later, author Dave Schwensen in the same trailer with "The Beatles In Cleveland." No fans waiting outside, but still a fab time! 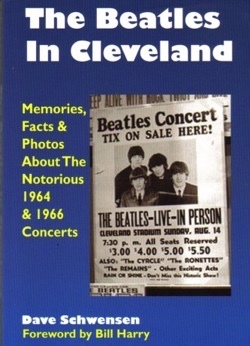 Purchase author signed copies of The Beatles In Cleveland for $15.96 - 20% off the retail price of $19.95 - and receive FREE shipping anywhere in the continental United States. Please use the contact form below for mailing rates outside continental U.S. 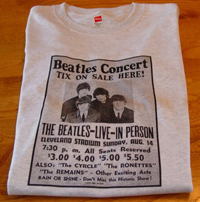 Exclusive Beatles In Cleveland 1966 concert poster t-shirts and signed book! Medium, Large and XL and 2XL sizes. Shirts are not sold separately. Author signed book and shirt combo is available in U.S. only. Please be sure to select proper shirt size when ordering. For questions or more information please send an email to debbie@northshorepublishing.com. Thanks!